Drawing the figure is immensely difficult and it is good to have several different approaches to work from in order to check the accuracy of one’s work. When a pose is especially difficult, it allows one to come to terms with it and achieve the effect one is after with a smaller degree of frustration. I always begin with the most important elements- the action and the proportion. These are a priority. This basic armature is absolutely necessary for a solid figure drawing. But from there, I allow myself freedom and variety to achieve the volume of the forms and the modeling as I see fit at that particular moment. 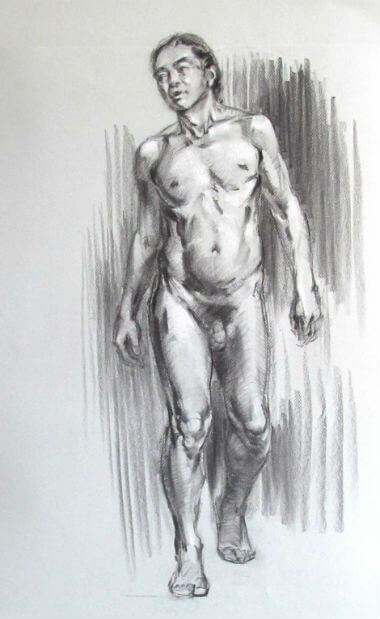 One strategy I use is to work from the interior forms of the figure and slowly resolve them, taking my time and allowing them to express their full volume through modeling, such as the abdominal muscles of the torso, prior to describing the outline or linear aspect of the figure. It is a method that creates the feel of sculpture- where line does not yet exist until there is a resolution of the form. Only after the form is resolved is one left with the exterior rhythm as a linear movement. One has to look at the larger aspect of what one is after. If I allow what is within to emerge- the “interior-ness” expressing itself through exterior forms, then I must look to a greater analogical relationship to achieve what I am after. If I am searching for an “interior-ness” to be expressed than I must use a method that corresponds to that search or vision. When one looks at the work of someone like Eugene Carriere, 19th century draftsman, painter and lithographer, one feels this central movement from within. Carriere achieves a certain beauty through enveloping forms in a diffuse light. They are shadowy figures where one catches glimpses of what remains always partially hidden. And because they lack the descriptive concreteness of line, they almost take on the characteristics of a spirit. His method equates the diffusion of form with an embodiment of the spirit. Line is the rationalization of what one perceives. It is a construct that one uses but does not exist in nature. Nature is a multiplicity of forms and masses. But when one is working in two dimensions, putting charcoal to paper, then line is a necessary element to expressing the form to its fullest. Without line, one cannot feel the solidity of the form or express a sudden contrast between the figure and the background. But by modeling the interior forms first, one can add line as one comes to know more clearly one’s intentions. Delineating the forms and masses with line can be delayed until one comes to terms with: the location of the focal point; the greatest area of contrast; those areas where a solid structure is necessary to express the form; the variety of lost and found edges; and the dynamic rhythm of line to express with intent all the emotions one is after. Only then can one express a line with grace, beauty and furia. Hi Judith, I would love to resume studying color theory with you in your figure class on Tuesdays . What I have learned from you so far has allowed me to begin to unlock the key to having color really work in my figure paintings and get through a barrier that seems to have been in my way for years. However because I am teaching my own class on Tuesdays I will be unable to come back to your class till the winter break in December and I am very much looking forward to studying with you again then. I find it very interesting what you wrote in your description of working from interior forms and am looking forward to trying it in a drawing soon. I like your drawing on this post very much. I especially love the way you handle the halftones so deftly and so descriptive and your drawings are always so full of rhythm. Hey everybody reading this, if you get the chance, study with Judith Reeve she really knows what she is doing and is a master with color. A true artist with a wealth of talent and knowledge.